John Tavener, a British composer known for his meditative, sometimes passionate sacred works and colourfully scored orchestral pieces – including the popular cello concerto The Protecting Veil, and the haunting Song for Athene, which was performed at the funeral of Diana, Princess of Wales – died Tuesday at his home in Child Okeford, in southern England. He was 69. James Rushton, the managing director of Chester Music, Mr. Tavener’s publisher, announced the death. A spokeswoman for the company said that the cause had not been determined. He was, however, known to have serious health problems. Mr. Tavener was a quiet man who cut an otherworldly figure: he was 6-foot-6 and rail thin, with light hair that he wore shoulder length even as his hairline receded. His manner – focused and unambiguous when speaking about his music, and vaguely mystical if equally intense when speaking about his other passion, religion – mirrored his invitingly tonal compositional style. But his opinions, though gently expressed, often had a sharp edge. After he became a follower of Russian Orthodox Christianity, he spoke critically of Western Christian beliefs, and of the sacred music they yielded, including the works of Bach. In recent years this view softened: in 2007, he told a New York Times interviewer that he had reconsidered some of his beliefs and had returned to playing Bach on the organ. It was in another, more secular life, and with the help of two of the Beatles, John Lennon and Ringo Starr, that Mr. Tavener came to prominence. Having studied at the Highgate School and the Royal Academy of Music in London, where he was born on Jan. 28, 1944, Tavener was working as a church organist, teaching and conducting by the late 1960s. But he was also working to get his own music heard, and a chance meeting with Mr. Lennon and Yoko Ono at a London party in 1968 led to a contract with Apple Records, the label the Beatles had just started. Mr. Lennon was drawn to Mr. Tavener’s music after hearing a tape of his opera, Notre Dame des Fleurs, based on the Jean Genet novel, but he soon lost interest in the project. Mr. Starr took up Mr. Tavener’s cause, and Apple released two of his large-scale works: The Whale (1968), based on the story of Jonah, and Celtic Requiem (1969). Mr. Tavener’s interest in religion at first slowed him down. He converted to Russian Orthodox Christianity in 1977, and at the request of an archbishop, he composed a large liturgical work that led him to rethink his style. Eventually he found a style of his own, and by the late eighties – the first performance of The Protecting Veil, by the cellist Steven Isserlis, in 1989, was a watershed – he was again composing prolifically, not only for the church but for concert halls as well. He said, however, that even his instrumental works had a mystical subtext. Among Tavener’s numerous health problems was Marfan syndrome, a congenital disorder of the connective tissue that limited his ability to travel long distances. In 1991 Tavener married Maryanna Schaefer, who had helped him come through his surgery for a leaking aortic valve that year. She survives him, as do their daughters, Theodora and Sofia, and their son, Orlando. Information on other survivors was not immediately available. 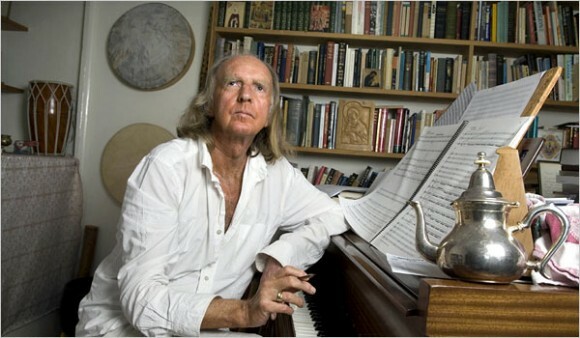 In 2000, Tavener was knighted for his contributions to British music.